Crawfish get a good rinsing at Merlin Schaefer's seafood business in New Orleans, Louisiana. New Orleans, Louisiana -- After 41 years in business, the Schaefer family have pretty much seen it all. Good times when business was booming, and tougher years that brought hurricanes such as Katrina and Ike. Now, a man-made oil disaster is trying the Gulf Coast, and the Schaefer family is in crisis mode -- again. "Everything else taught you how to survive," says Merlin Schaefer, who runs the family business. "It feels like another hurdle: Get over this, and hopefully after that, we'll have a little straightaway." 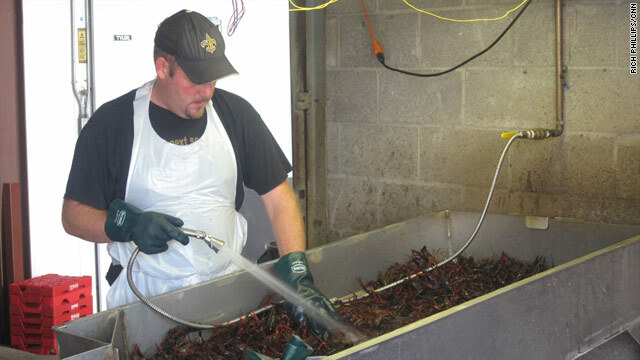 Merlin Schaefer and his family and employees were working hard to get the crawfish and shrimp ready for their Memorial Day customers. The business is near the 17th Street Canal, by the levy, in the Bucktown section of New Orleans. With this past weekend's failure to shut down the underwater oil gusher in the Gulf, Schaefer is frustrated. "It's almost like it's another attempt that they don't know what they're doing." "I don't know how many more days we're gonna have to be able to get the good seafood that we've been getting." Schaefer says he drives to Texas, five hours each way, to bring back much of that seafood. He says he's trying to stay ahead -- trying to make as much money as possible, while he he still can. "Right now, we're getting a little bit in. Come a month from now, we don't know what's going to happen with the shrimp. We're taking every day that we can get," he told CNN. As BP engineers begin another attempt to shut down the leak, hope is alive, but so is anger and frustration that the disaster could have been avoided. "Look, we got the [New Orleans] Saints to win, so we're into divine intervention. We were hoping that anything would help those engineers close that oil leak," says retired Army Gen. Russel Honore. Honore is a household name in Louisiana. A resident of nearby, Baton Rouge, he took over the U.S. response to Hurricane Katrina, in 2005. Though he is still hopeful, Honore says the failure to plug the leak is wearing on Gulf Coast residents. "I'm sure, every time they hear a negative word, their skin crawls, 'cause they need these jobs. ... This is what's going to put their kids in school, and what pays the rent." In Venice, Louisiana, Larry Hooper, a fish charter captain, says his business shut down because BP was more interested in making money than in running their own business properly. Normally, Hooper says, he'd be at sea. Today, his business is drowning on shore. "The phone never rang in early May, except to cancel the trips in June and July," he says. On the other side of the Cypress Cove Marina, Capt. Sean Lanier is feeling the pain too. "Until they stop this leak, it's just like getting stabbed and the knife's still in you, and they're moving it around," he says. As far as the U.S. government taking a more active role -- Lanier says, no way. "They're good at running armies and making highways. I just wish they'd stay out of it, 'cause they usually screw up something worse than what is," he says. But back in New Orleans, Merlin Schaefer puts a fresh sack of crawfish in a customer's cooler. As BP tries to shut off the leak that threatens the products his family began selling in 1969, he is hopeful the oil giant will come through in the end. "There's nothing you can do. You have to have mercy," he says. "That's why you have to trust them that they're going to do what's right."